We are Mike and Dianne Six and together, personally tend our distinctive herd of fiber producing alpacas each and every day. With our professional backgrounds in program management, consulting and sales, our attention to detail, organization and excellent customer service have been applied to our newest venture, our farm. Mike is already a full time fiber farmer. With deliberate skill and infinite care we have set our course to both be full time fiber farmers with in the next two years. Is simply to raise and produce the highest quality animals and fiber, for the benefit of the breed and the people who purchase them. Having fun and making new friends adds the finishing touch. 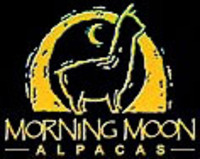 Morning Moon Alpacas is a family owned and a hands-on family operated farm of 18+ years. With the exception of the necessary veterinary visits, we manage our animals by ourselves on a full time daily basis. By working closely with our vet and attending as many seminars as possible, we have become proficient in most areas of herd health management. Safety and sanitary inspections are conducted daily to maintain our high standards and the animal's well-being. We honestly love our animals and the lifestyle we have with them and look forward to our daily interaction. Alpacas are not the only animals we enjoy here at Morning Moon. Our three Great Pyrenees mix keep close company with our alpacas as well as make outstanding livestock guardians. 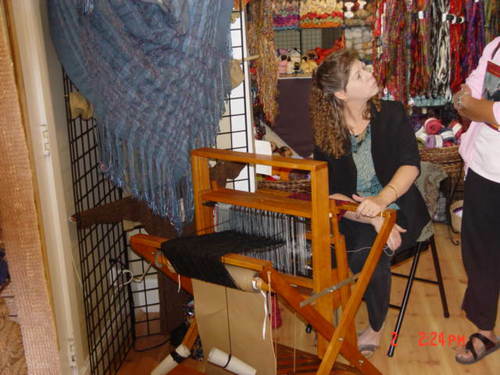 We use and work with the fiber daily and promote the fiber arts to various groups such as our local knitting and weaving guilds, 4-H and every one who is interested. We encourage learning and community support. We offer regular educational, public and private farm tours. Fiber remains our number one interest however, and we love sharing the art with young and old alike. In addition to our quality breeding animals, we have animals that are solely fiber animals. 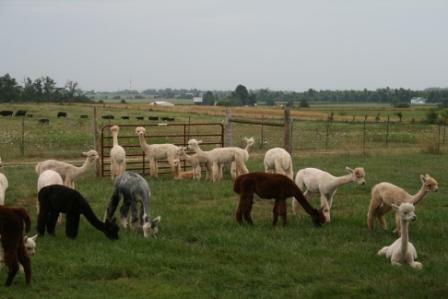 These are typically gelded alpacas that are healthy and fiber producing but were in need of a good home. We are always working to ensure that animals such as these have a safe, healthy and happy place to live whether it is on our farm or with another capable family. We encourage learning and community support. Our youngest son's (24 now), second grade class came for a visit and everyone had so much fun that we decided to offer regular educational farm tours. Fiber remains our number one interest however, and we love sharing the art with young and old alike. We would like you to visit Morning Moon Alpacas. We are located on a beautiful farm located in Anchor Hill Ranch, Rogersville, Missouri. For Directions please select the "More Info" tab. While on a routine supply quest for a knitting project, an accidental yarn avalanche at a local shop revealed a ball of yarn so incredible to the touch that I was astounded. It was alpaca. 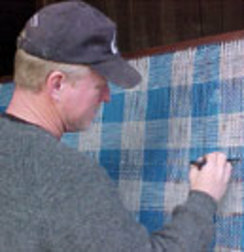 For three months I worked with alpaca yarn on every project I could put my hands on and knew I had to discover the source of my new passion. 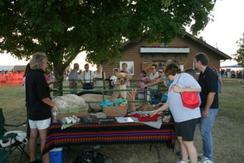 I located a nearby alpaca farm and volunteered there most every weekend for a year. 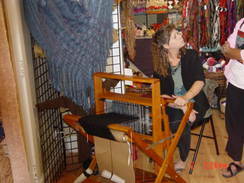 I wanted to learn all I could about these gentle, luxury fiber producers and I wanted to make certain that I was not just acting on a whim. The day came when no longer was I satisfied volunteering at someone else's farm, I wanted to make alpacas a part of my every day lifestyle. 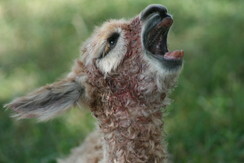 When I came home and announced to my husband that I had just purchased three alpacas, he did not even flinch. He already knew what an incredible investment they are. The farm purchase came next and Morning Moon Alpacas was born.